The Biblical World: And the Bible flew over the moon. Ok, I know that in the nursery rhyme it is the cow that flew over the moon. 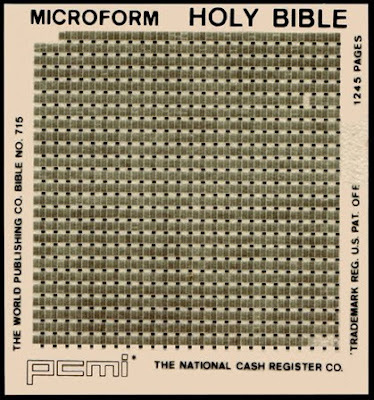 But apparently so did the Bible when it was put on microfilm and carried on the Apollo 14 space capsule. And you can own it now for a bid of $5000 or more. Here is the story. A bible that has sat on the moon's surface is being sold by the RR Auction House. Dubbed a "moon bible," the piece starts at a minimum bid of $5000. The idea for a moon bible was thought up by the Apollo Prayer League, a group of religious NASA employees who got Apollo astronauts to carry copies of the Kings James bible with them on space missions. A total of 300 bibles made it into the cosmos during the Apollo 14 trip to the moon (although only a 100 made it to the lunar surface). There is no gravity in space, of course, but clearly carrying 300 books of over 1,000 pages each would be troublesome for NASA, no? No. The bibles were converted to microfilm so they could be easily carried and so they didn't take up valuable room and weight during lift-off. "On February 5, 1971, they made their historic landfall with Alan Shepard​ and me on the Moon at Fra Mauro, and remained for 34 hours," Apollo 14 Lunar Module Pilot Edgar Mitchell says on a signed certificate accompanying the bible. The bibles also traveled on the ill-fated Apollo 13 mission, which aborted its moon visit in order to safely return to Earth. If the moon bible itself wasn't enough, the microfilm slide is housed in a 22 karat gold and jewel display case and topped with a crown. the circular case reads "The First Lunar Bible." It also comes with a copy of C.L. Mersch's book “The Apostles of Apollo,” which details the bibles' journey into place. The auction begins Sept. 15. Also for sale is Neil Armstrong's Apollo training glove and a Russian Sokol KV-2 Spacesuit. Yet another demonstration that active imaginations combined with too much spare time and excess money can result in an abundance of silliness, on so many levels. Some days your sense of humor just slays me! Is this your Friday book giveaway for the week?!?! If so, I'm in! !